The top three vendors of paraxylene, namely Reliance Industries Limited, S-Oil Corporation, and BP plc., collectively accounted for a meagre 12% of the global paraxylene market in 2015. Nearly 85% of the production in the global paraxylene industry is credited to a vast number of small firms or subsidiaries of larger chemical companies, making the market highly fragmented. Companies are focusing on export as a key tool for geographical expansion in existing as well as unexplored markets in Asia Pacific. Forward integration by key manufacturers across the value chain is likely to be a prominent feature of the global paraxylene market in the coming years. Transparency Market Research states that the global paraxylene market, which held a value of more than US$33 bn in 2015, is expected to exhibit a healthy 7.0% CAGR from 2016 through 2024. If the prediction holds true, the paraxylene market will rise to a value of more than US$60 bn by 2024. 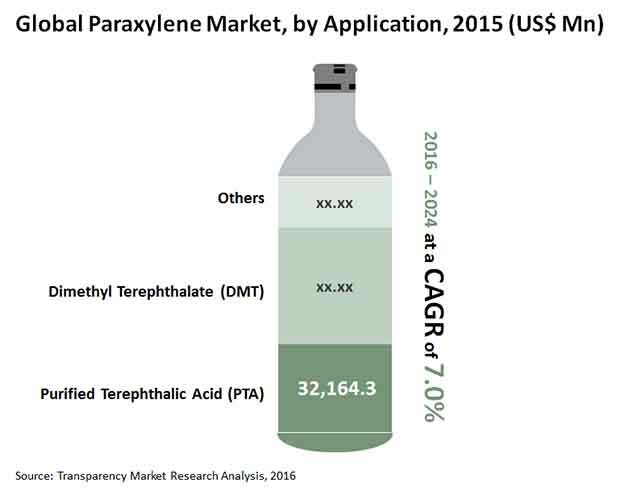 Of the key applications of paraxylene, its use in the production of purified terephthalic acid (PTA) earns the market a dominant share of its revenue. In 2015, the segment accounted for nearly 97% of the overall volume of the global paraxylene market. From a geographical perspective, Asia Pacific is the leading regional segment of the global paraxylene market and accounted for nearly 84% of the market in 2015. Paraxylene is one of the key raw materials used in the production of purified terephthalic acid (PTA), which is used to manufacture PET. The high use of PET in the textile industry across applications such as clothing, furnishings, and technical textiles earns the global paraxylene market a significant share of its overall revenue. In the next few years, the rapid growth expected in the textile industry is expected to have a significant positive impact on the development of the global paraxylene market. Analysts estimate that the textile industry will exhibit an 11% CAGR from 2016 to 2020. This factor is likely to lead to a vast rise in demand from the global paraxylene market in the near future. The rising demand for PET container resins, especially in Asia Pacific, is also expected to provide significant traction to the global paraxylene market over the forecasting horizon. The increased use of PET containers for packaging in the flourishing food and beverages industry in the region is likely to result in an increased demand from the paraxylene market. The global market for paraxylene is, however, expected to be hampered due to the rising concern regarding the oversupply of paraxylene in Asia Pacific and growth in consumer awareness about plastic-free products. Many countries across developed regions such as North America and Europe are taking measures to completely ban the use of plastic bags and packaging materials. Implementation of stringent government regulations regarding the same is expected to have a significant negative impact on the development of the paraxylene market, at least in developed economies. Chemicals such as antimony oxide, acetaldehyde, and aldehydes are employed in the manufacture of polyethylene terephthalate products. Antimony oxide, which is used as catalyst in the manufacture of polyethylene terephthalate, and trace amounts of acetaldehyde and aldehydes are some of the unavoidable byproducts in the production of polyethylene terephthalate containers. These chemicals are hazardous to the environment and human health. Awareness regarding such adverse effects of paraxylene production and its substitutes on humans and the environment is rising at a promising rate across developing economies as well. These factors are also likely to collectively hamper the global paraxylene market’s development over the forecast period.